Hopper had been plagued with pain and a short stride due to severe bracing throughout his body and depleted hoof structure. He had significant P3 bone loss with short length step and toe-first landing. 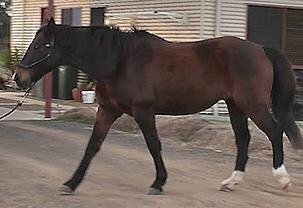 This highly stressed and easily spooked horse has had a remarkable recovery due to change in diet. The vet and many horse therapists had given up on Hopper. He was a hard case, but I loved Hopper and was determined to find a miracle for his recovery. 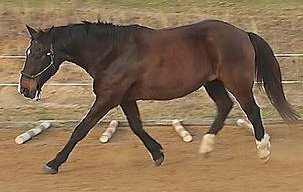 That miracle I discovered was MAGNESIUM because it turned out that he had a common case of magnesium deficiency in horses. Various dietary changes were trialed since 2003, including a chopra mix and decreasing feeds containing calcium and oxalates. However, the most significant improvements happened from 2009 when I started the magnesium chloride feeding method. This was also a time when exercise was limited to permanent pasture turnout and very light groundwork. There was no restriction to 24-hr grazing and little exercise beyond free-choice whilst grazing, yet Hopper was nevertheless able to maintain impressive recovery. There was no change to trimming technique during that period. 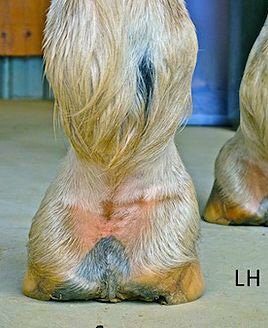 Symptoms of Magnesium Deficiency in Horses can be overcome via supplementation with magnesium, chromium, unrefined sea salt and sodium bicarbonate, as well as reduction of dietary elements such as calcium (which may inhibit magnesium uptake) has improved the structure of Hopper’s feet and relaxed his body posture. As Hopper’s hoof structure regenerated we could see his overall posture straightening and improving. He relaxed and became rideable again. Hopper’s case of recovery from a severely depleted state showed us that we should not give up unless all the options have been exhausted. When we came upon the missing mineral – magnesium – we saw the recovery before us and it was a great triumph. 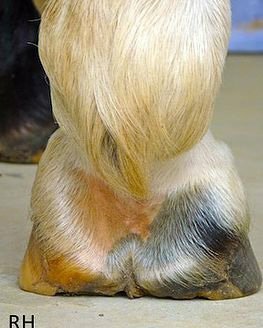 Hopper’s problems did not originate in his feet or an injury or posture, but rather, his severe magnesium deficiency had contributed to the hoof disorder which then led to the disabling posture and pain. Hopper has been consistently quiet and calm (with no spookiness nor aggression) since his diet was changed late in 2009. 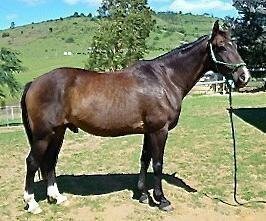 At the age of 13 he became the sound, happy horse he should have been as a 3-yr old. oaten chaff, copra, 60g magnesium chloride, 5g chromium yeast, 60g unrefined sea salt, 20g sodium bicarbonate, unlimited Rhodes pasture, drinking water neutralized by sodium bicarbonate.